Voyager has been in orbit around the Mari homeworld for the past three days resupplying and taking some R&R. In a local market Janeway and B'Elanna are negotiating with Frane (trader) for a part and making it a little more complex is that the people of this world are telepathic. Neelix is getting seriously interested in a native woman (who sells produce) and Tuvok is spending time with one of the few local law enforcement officials, violent crime has all been eradicated from this world mirroring Vulcan. As it happens a brutal beating takes place in the local market moments after B'Elanna has been bumped into and spoken her mind to the same man who took part in the beating. The investigation begins and includes telepathic probing of the memories of the Voyager crew as well as a technology based scanning of the brain to record memories and thoughts. B'Elanna is arrested not for actually beating the man but for having the initial thought which was then picked up and acted upon, in this world violent thought itself is a crime punishable by memory erasure. 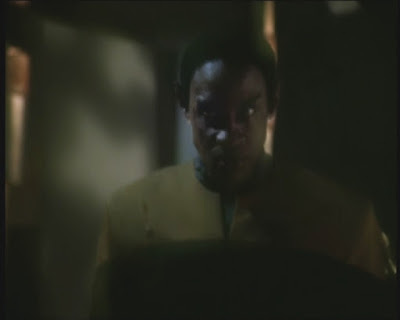 There doesn't seem to be anyway around the law of the land but Tuvok is allowed to conduct his own investigation and learns that the man who did the beating has a record for having violent thoughts but records indicate he had been treated and cured. The next day an old woman approaches Talli ( Rebecca McFarland ) the young woman Neelix is interested in and stabs her to death, the same violent thought is at the centre of the act yet the two people originally involved were no where near. Tuvok has a thought and tracks down Frane and discovers that there is underground black market for the supply and trade of strong and violent emotions, he offers his own dark emotions/memories in trade for the truth behind the market attack and then reveals to the authorities the true depth of the problem that lies beneath the peaceful exterior of Mari. Random Thoughts begins with Voyager in orbit and as always the CGI is very good for it's time, we learn the crew have been going down to the planet for the last three days and Neelix is sweet on a local girl, a nice moment with him and Tom in the transporter room. I'm quite surprised any non-telepath would be comfortable amongst a race who freely read eachothers minds, there does not seem to be any privacy taboos or strictures like on say Vulcan. An interesting concept as well in outlawing violent thoughts, I would imagine the social upheaval three generations past must have been a very troubling time and while Nimira the city's Chief Examiner (copper) seems to consider prison cells and associated methods to be barbaric when we hear the flip side of their culture it certainly proves their methods can be just as draconian. Wiping memories of people who have violent thoughts even if they don't act of them is extreme to say the least and we learn later some people are being conditioned this way time and time again, it may be cleaner on the surface but this culture is just as broken. Infact unlike Vulcan whose people have learnt to master their darker impulses having a population with no experience of them it comes as no surprise when exposed to negative emotions they go off the deep end. The biggest issue of course is that Tuvok in three days should have learnt all of this from Nimira and had Voyager drastically limit the interaction of the crew who have no control over their own thoughts. Later after Janeway has recalled the crew we still see Neelix and Seven on the planet which may have been a continuity error but the second murder finally gives Tuvok a glimpse at another avenue to explore. The trade in negative/dark emotions and thoughts obviously fills a gap in this culture, easy to "steal" anothers thoughts and pass them on again, no practical mental shielding for this race and it makes you wonder how long telepathy has been in their DNA. There was some intense scenes as Tuvok investigated Frane and went off the grid but it was a bit of a joke how easily he was subdued or maybe that was part of his plan to ultimately be in a position to overload Frane with real world negativity. In many ways it was a simple overdose for an addict who gets hold of some pure drug after being used to heavily cut product, the only real issue is they could have played up the effects it may have had on Tuvok, extra meditation sort of thing but they chose to have a mildly humourous Seven confronting the Captain ending. Random Thoughts wasn't an episode I was looking forward to watching but it wasn't as bad as I seemed to remember, I won't be going out of way to watch it again just to kill an hour or so if only so that my mind is never scarred again by Neelix having his whiskers tugged.